Today will be a bit of a change for me, in that I won’t be reviewing a heatsink. 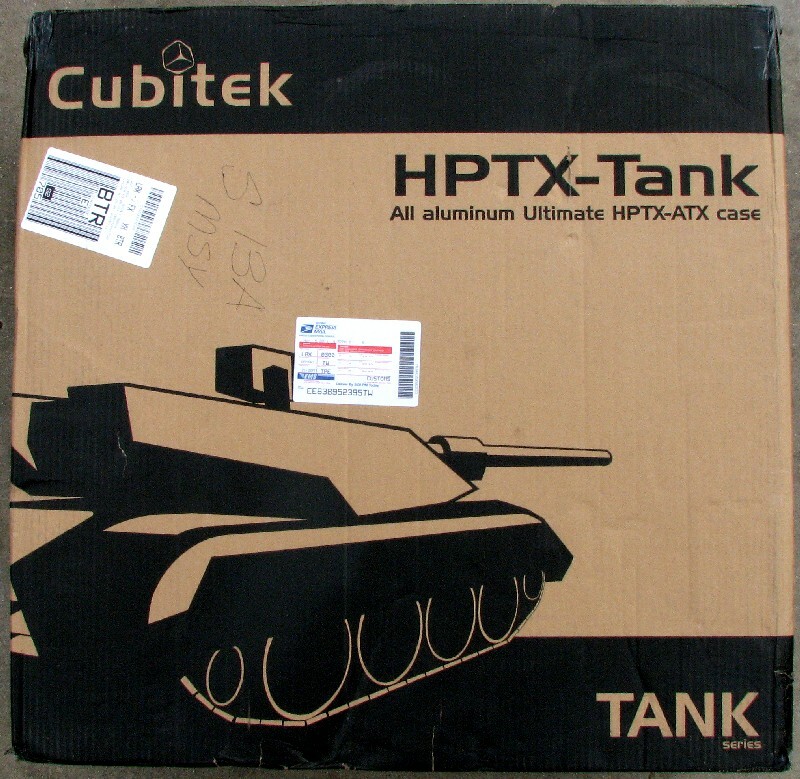 Instead, I will be doing a case review of the Cubitek HPTX Tank. 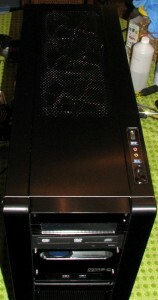 As the name suggests, it’s a monster sized case that can accommodate any size motherboard and a whole lot of hardware. We’ll be seeing if the HPTX Tank can live up to its name. Cubitek is a new company in the retail market, but that doesn’t mean they are new to designing quality cases and enclosures. In the last ten years, they have produced some server cases and around the middle of last year the company was reorganized to design and bring to the retail market their own brand of retail gaming cases. The name “Cubitek” originated from their managing director, Tim Huang, and it stands for “cubic technology”. If the looks of this enclosure remind you somewhat of Lian Li, don’t be surprised. All of Cubitek’s team came from Lian Li in the past, and I can’t deny the understated elegance of Lian Li cases and the HPTX Tank case. The Tank Series is designed for high-end gaming PC users with space for large CPU coolers and long VGA cards, lots of storage space, superb cooling performance, inversion of the PSU, excellent heat distribution, and liquid cooling ready. The Tank Series is available in three designs: Mini Tank, XL Tank, and HPTX Tank. Aluminum full tower case designed for the EVGA SR-2 motherboard, the Full Tower HPTX Tank case fits 2 x PS/2 PSU, 9 x 3.5” HDD, 2 x 2.5” HDD, and 5 x 5.25” ODD. One 5.25” to 3.5” converter is included. Fits E-ATX and EVGA SR-2 motherboards, 220mm+ long P/S2 PSUs, and 340mm long graphics cards. 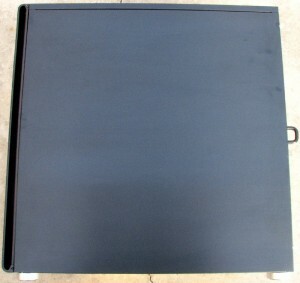 The box for this case measures 27 1/2 inches tall by 27 5/8 inches wide by 12 3/8 inches deep (700 x 702 x 314 mm) . The box is of sturdy, plain brown, corrugated cardboard with pictures and marketing bullet points printed on it. There was no money wasted on this one with fancy artwork or shiny finishes: just a good, sturdy box. The box arrived at my house in relatively good condition, with a couple of dings and scrapes, but it did its job and protected the enclosure within just fine. On the front of the box, there is a picture of a tank from the rear quarter view, along with the company name and the product name. 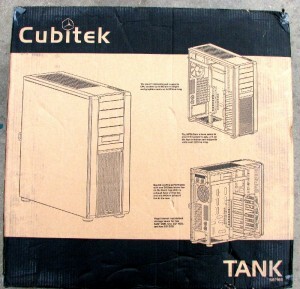 The left side of the box has the last of the back part of the tank picture wrapped around to it, plus some marketing bullet points highlighting features of the case. 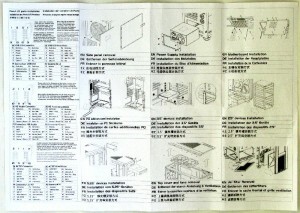 The right side of the box gives specifications for this enclosure in five different languages. The back side of the box shows a front quarter view of the case, plus a couple of exploded views, with various marketing highlights of features for this case. 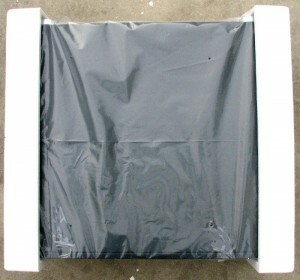 Once you open the top of the box, you see the case securely cradled by some Styrofoam inserts and the case itself inside a plastic bag to protect it from moisture. 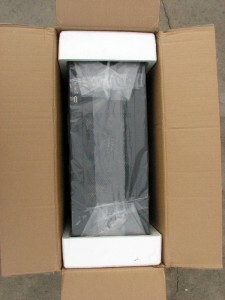 All in all, a decent packaging system to protect this enclosure during shipment. It doesn’t have the flashy looks on the box like the Dragon Rider case I reviewed, but that isn’t necessary either and I would rather see them spend money on better build quality and protection during shipment than making a box look flashy. Top open, secure in foam cradle. 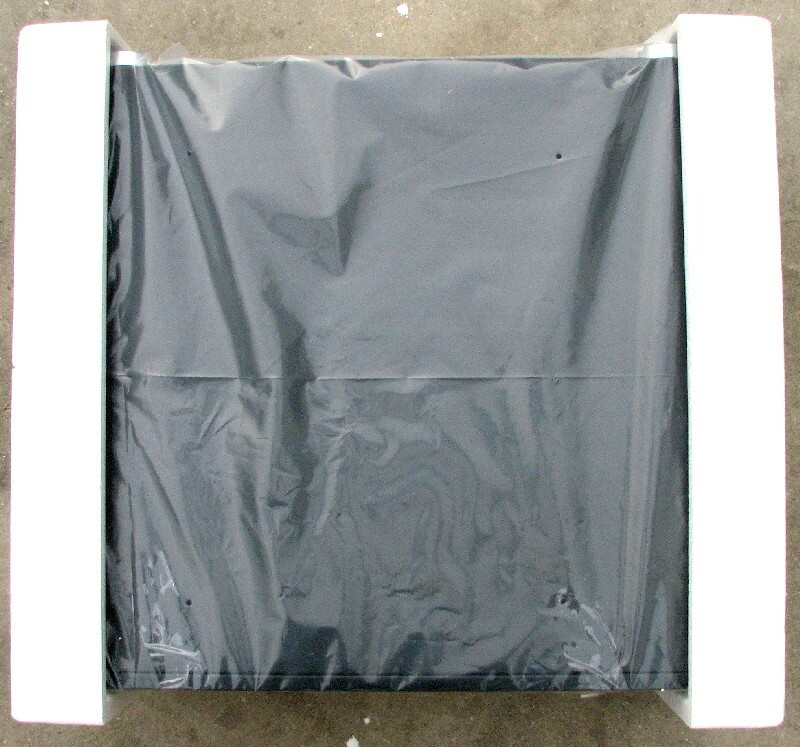 Interior packaging of the case. 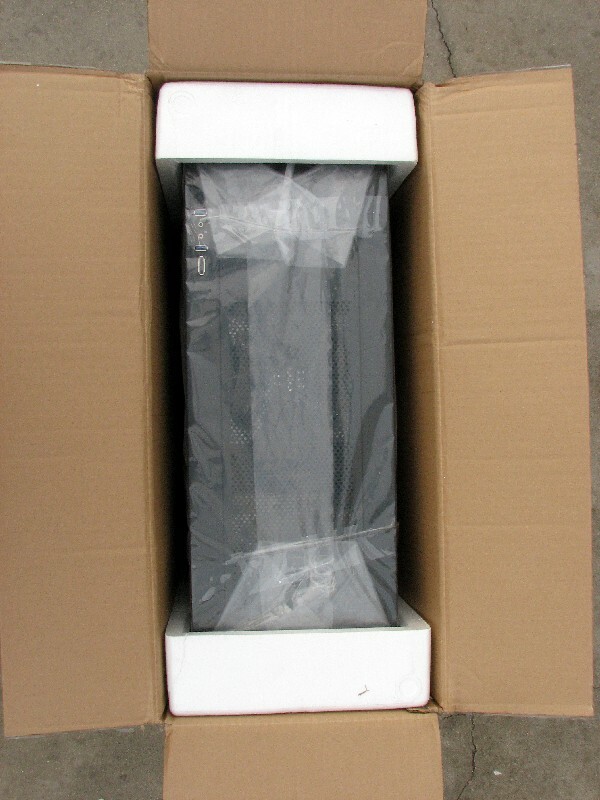 The accessories included with this case are contained inside a box inside the box as shipped. 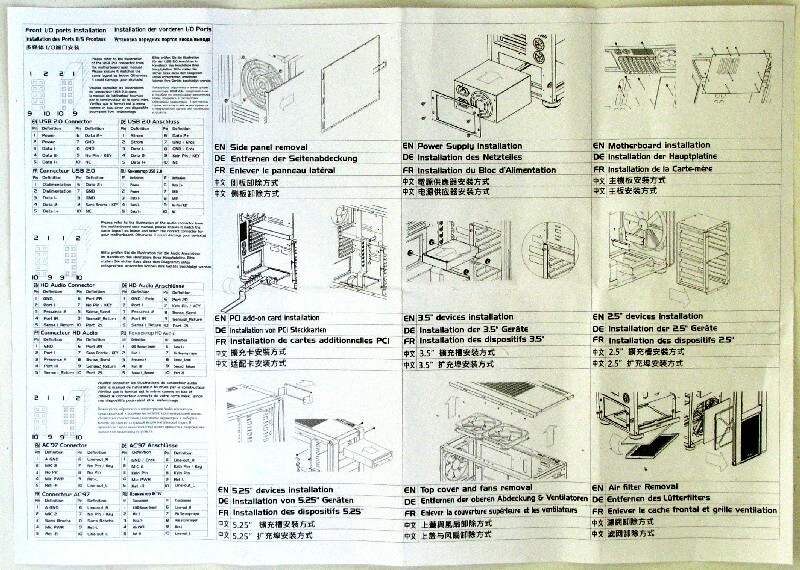 There are a couple of very brief pages covering installation of your components, as well as what comes with this case, with the text printed in five different languages. There is one 5.25 inch panel cover in the front that is cut out to be used to mount an 3.5 inch device you may want on the front. Inside the accessory kit you get 28 rubber isolation wheels for mounting the hard drives, plenty of motherboard standoffs, an Allen wrench for screwing and unscrewing the screws used on this case, plenty of thumbscrews for mounting your external devices such as fan controllers and DVD drives and a three pic fan splitter cable to enable you to feed a couple of fans off a motherboard connector. Also included is an adapter to change the USB 3.0 front panel pass-thru cables to internal connectors. This is very welcome as with this kind of setup it caters to versatility in connecting the front ports, but would be much better if Cubitek would give adapters for both USB 2.0 and USB 3.0 headers with this case. After all, there are usually several internal USB 2.0 headers on motherboards for years now, but only in the last year or so have motherboard manufacturers been putting internal USB 3.0 headers on their motherboards. If they included both adapters for the pass-thru cables, they would cover all bases with giving you front mounted USB without having to use a couple of back side ports. Cubitek does give you a pass-thru to USB 2.0 10 pin header adapter, so at least you can use internal USB 2.0 headers. 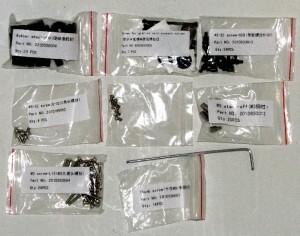 Here are a few pictures of the hardware that came with the case that are left over after the build. Unfortunately, I had an SD card failure that wiped out my pictures of the hardware before the build. Also here are a couple of pictures of the instruction sheet included with the case. 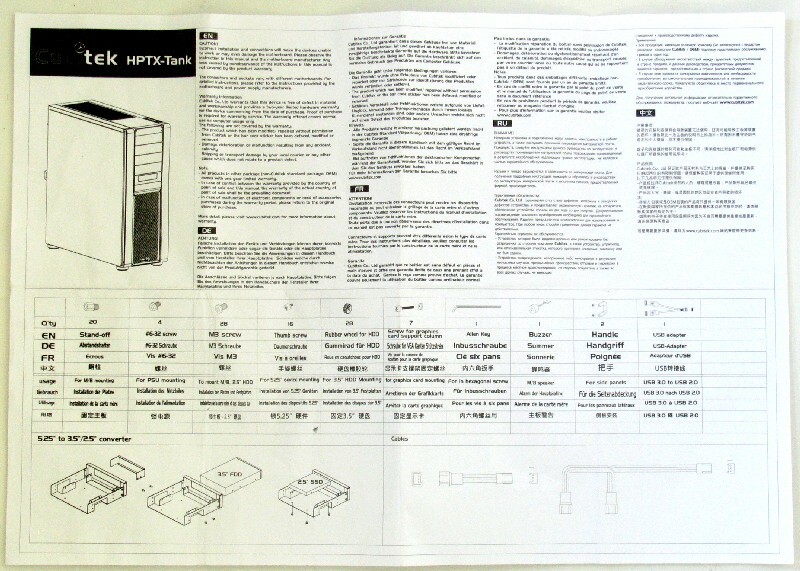 Very basic instructions, but good enough for 95% of folks out there using this case for a build. Some of the accessories included witrh the case. Back side of instruction sheet. Once out of the box and the plastic bag, you can see a massive looking case that is kind of plain. The case itself is made of anodized aluminum and if you are a fan of Lian Li cases, you will instantly love this enclosure. The fit and finish on the case is very good and just looking at the various features of this case speaks of its quality construction. 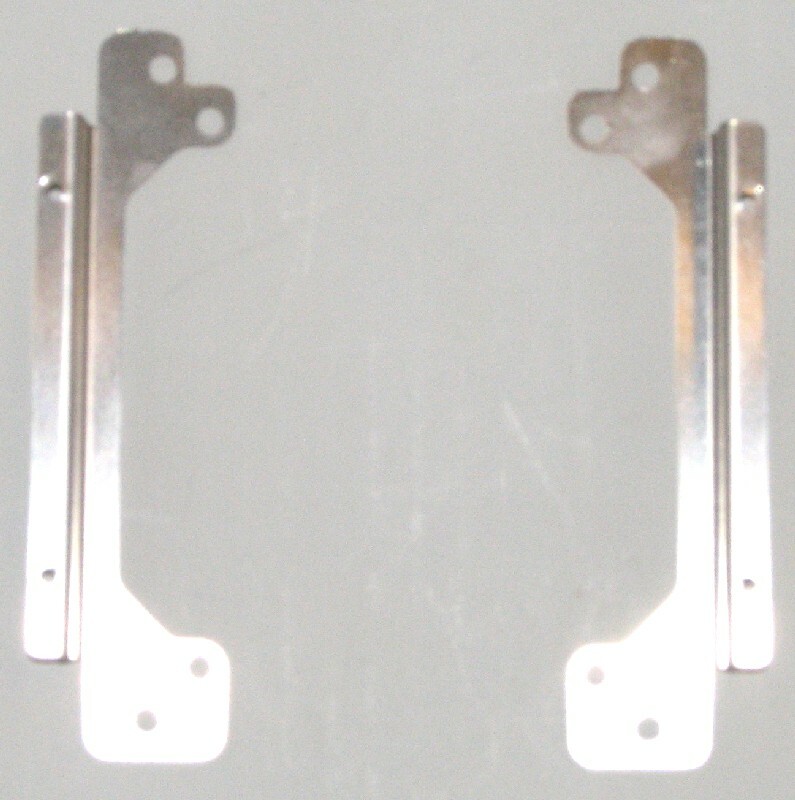 Instead of having plastic or rubber feet on the case, there are some nice looking aluminum feet that have rubber inserts on the bottom to make them anti-skid. The front face plate just snaps off to give you access to the 5.25″ bays and the front fan filter. 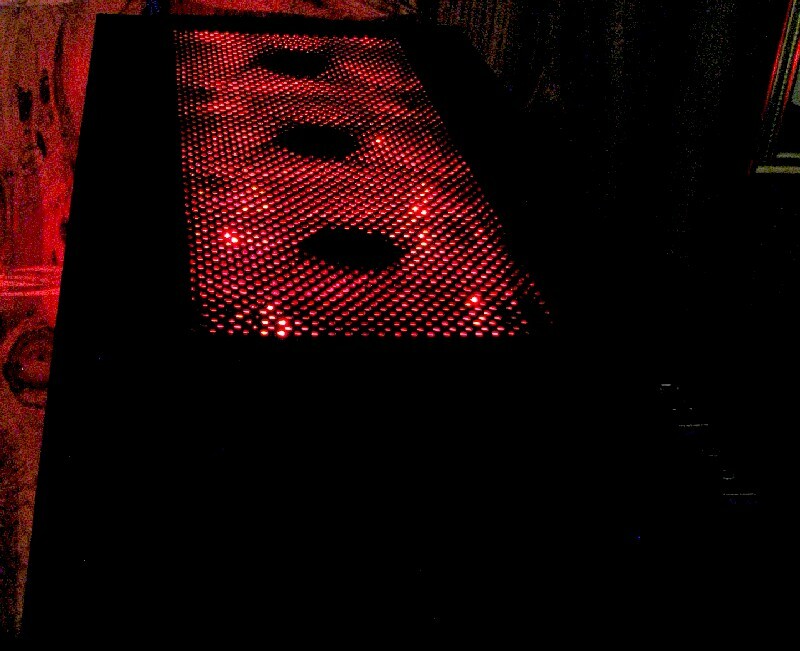 The front intake fan is a giant 200 mm fan that has red LEDs built into it. On the rear of the case, you see a single 140 mm exhaust fan, again with red LED lights built into the fan. 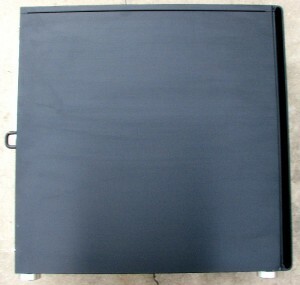 Also, the power supply can be mounted at either the bottom or the top of the case by having two otherwise identically sized removable panels on the back of the case. 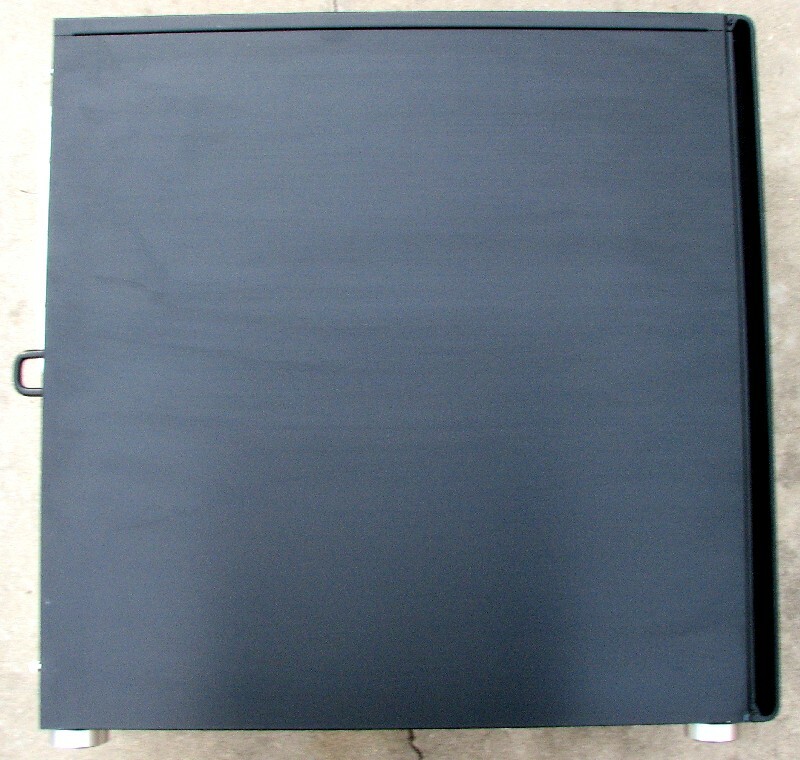 The removable sides of the enclosure have no windows and are held in place with two thumbscrews on the back side of the case. They have hooks that engage holes in the sides, then slide up to lock the side door in place. 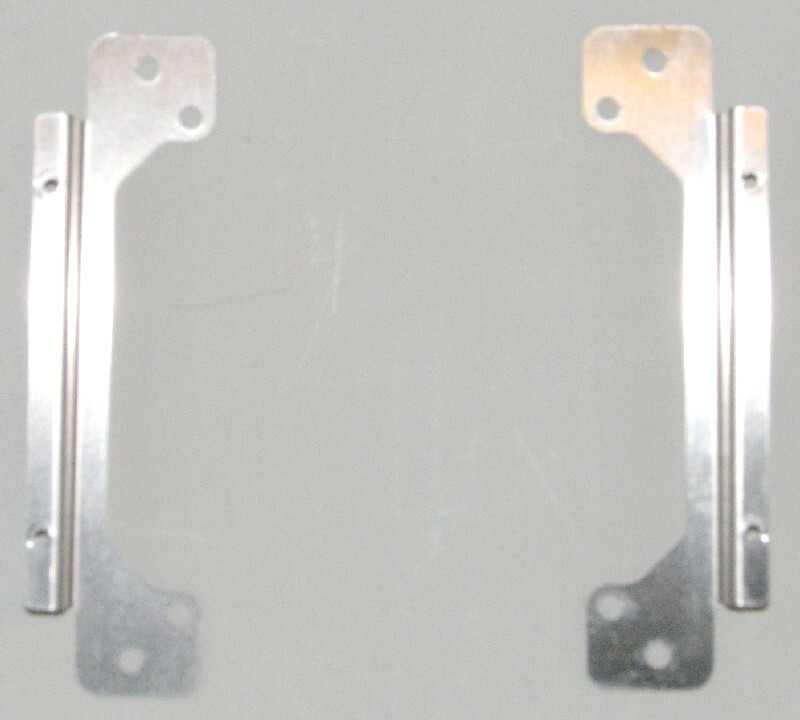 There are also handy “U” shaped brackets on the back of each case door, making it easy to slide the door back in the slots to disengage the hooks for removal. Going to the bottom of the case, you have the four quality feet I mentioned already, plus there is a trap door under the area the power supply resides. This is to give you external access to a foam filter there that will help keep dust out of your expensive power supply. That is a very welcome feature, in that you don’t have to go inside the case and remove the power supply to clean the air filter like I have to do with my Dragon Rider test case. 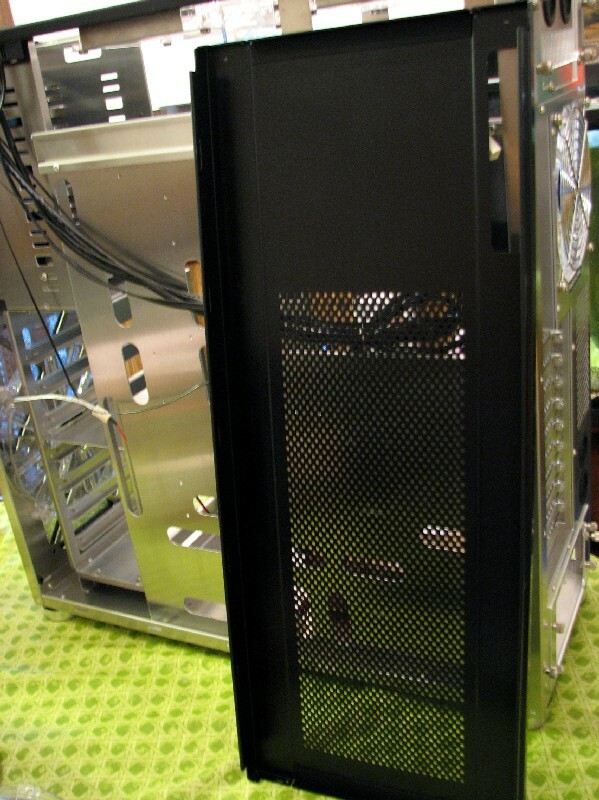 Going to the top of the case, you have a couple of USB 3.0 capable ports, an eSATA port and your usual audio ports. Nothing special here, but these are handy. Some people don’t like top mounted ports such as this and would rather have them on the front panel, but I have no problem with either location for these ports. 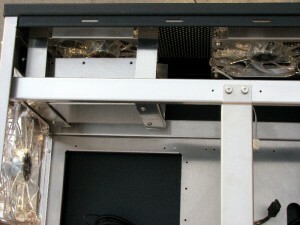 Top of case, with external connector panel. Once we pull the side panels off, we see a very roomy case with lots of thought put into giving the user maximum choices for mounting and cable routing. The motherboard mounting panel is well laid out, with a giant cutout behind the processor mounting area of a motherboard, as well as plenty of cutouts for cable routing. 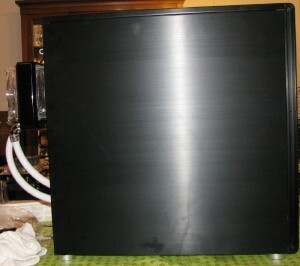 Other side, with side panel removed. 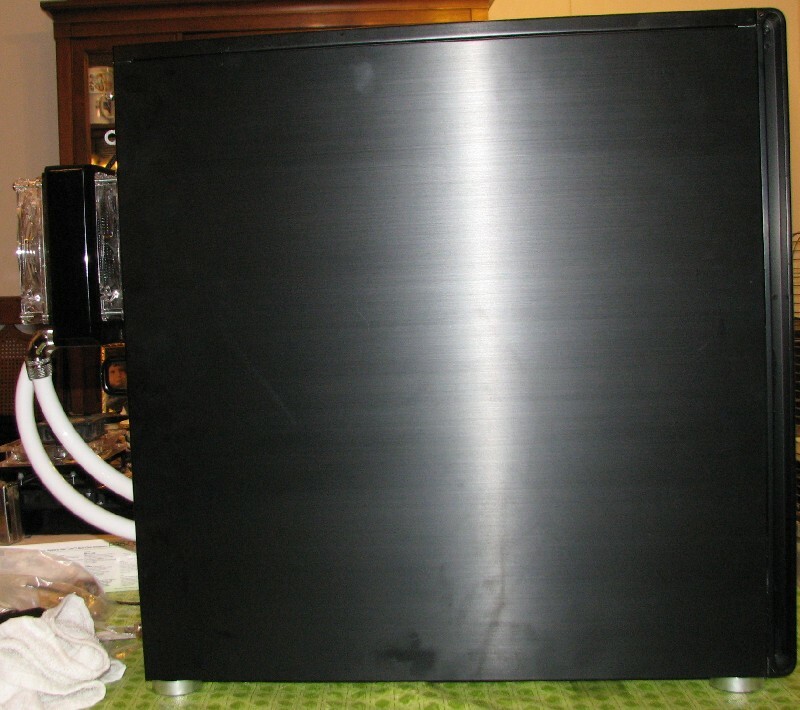 Large cutout behind processor mounting area makes installation of heatsinks easy. One thing that really jumps out at you with the side door pulled off is a bar running from the top to the bottom of the case more or less in the middle. I haven’t seen this on any case before and what this bar does is give support for add-in cards such as your video cards. 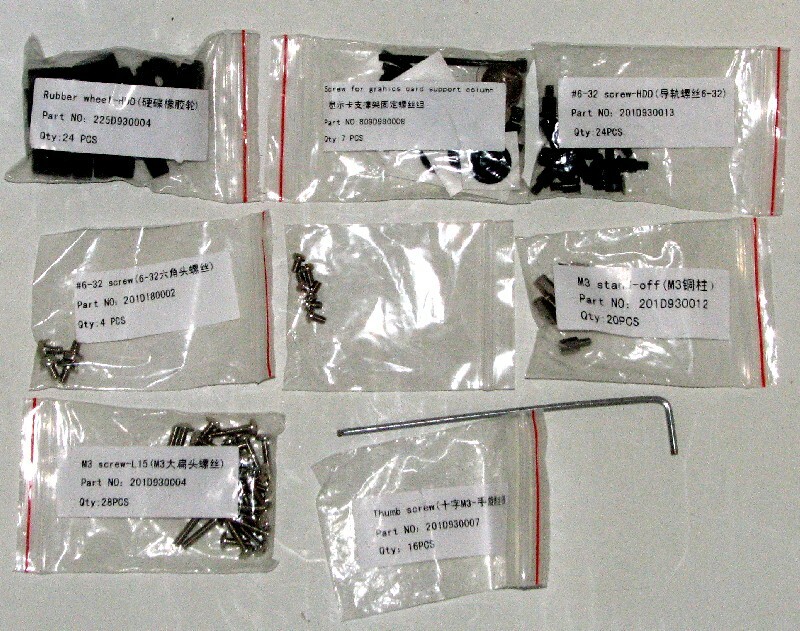 There are screws that go through this bar that you can use to help support long and heavy video cards and to keep them from bending or moving during transport or during usage. I can see where this bar would really help with high end video cards that have large and heavy coolers on them. This bar is easily swung out of the way or can be easily removed if not needed or if you need more working room while working inside. Since the video card is using a waterblock instead of air cooling, I had limited space to engage the GPU support bar with the video card. I ended up tightening it down on the six pin PCI-E power plug and it holds it pretty firmly like that. The 3.5 inch hard drives are mounted in the cage with some rubber cushion mounts, which isolate the hard drives from the frame very well. 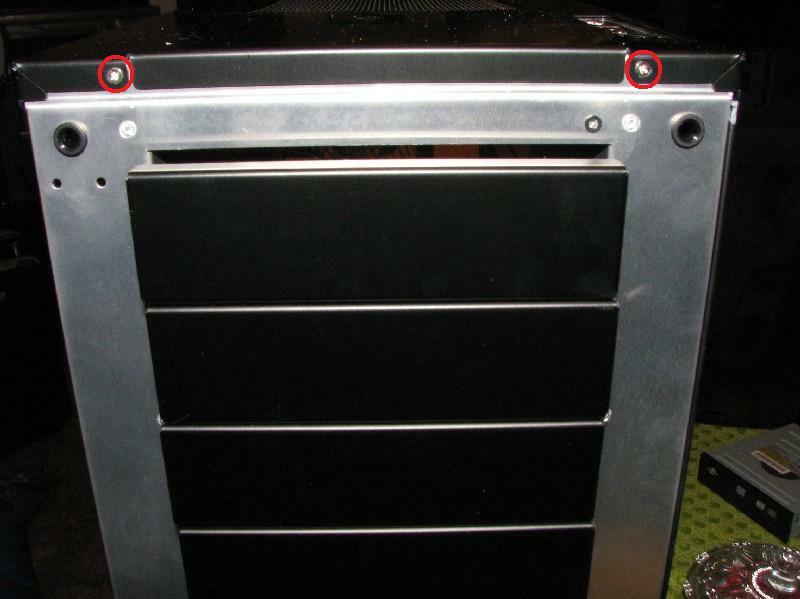 You should have no resonance problems between the hard drives and the case with this mounting system. Plus, it gives a good cushioning effect in case you would happen to suddenly jar the case. 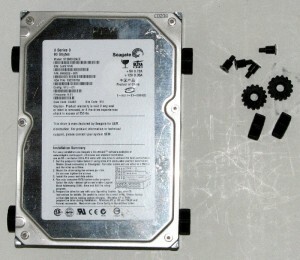 Hard drive with mounts installed and loose mounts and shoulder screws. 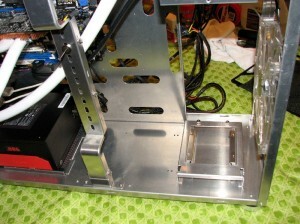 Side view of hard drive and installed mounts. 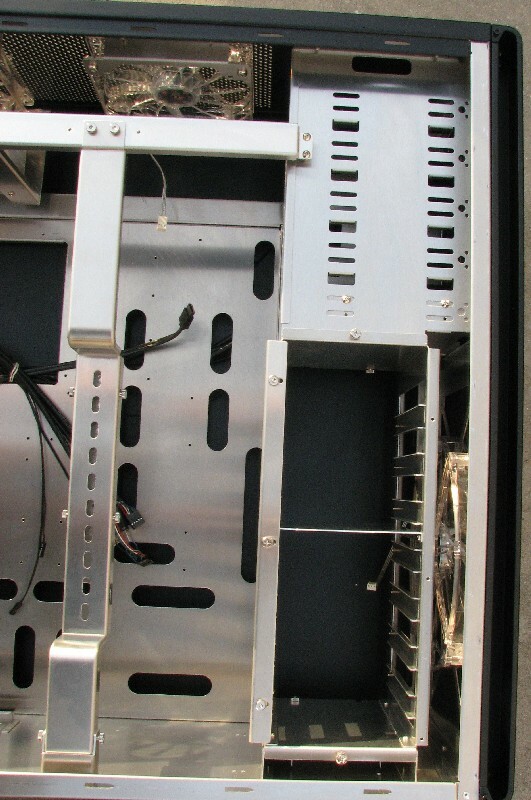 The hard drive cage itself sits to the right side as you are looking into the case and mounts the hard drives sideways in front of the intake fan. It mounts the hard drives with the connectors to the back side, just like Cooler Master does with their HAF series of cases instead of having them face towards the front of the side like my Inwin Dragon Rider case. I find that this makes for a neater and less cluttered install. The drive cage is removable with the removal of just a few mounting screws, making it very easy to mount up your hard drives. The 2.5 inch hard drive mounting spot sits in the case below the removable drive cage. 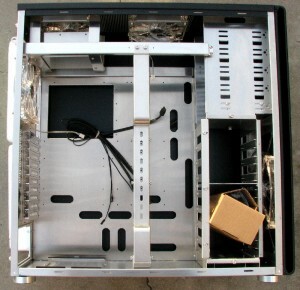 You can add an SSD or notebook hard drive there, which keeps it out of the way, yet still easily accessible due to the removable hard drive cage. 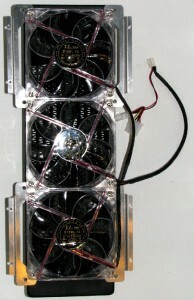 Rear mounted top fan, with aux. hard drive cage mounted beneath it. Interior front. 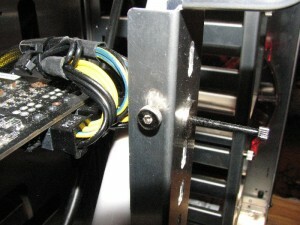 Hard drive rack removes by removing the top & bottom screws. Front on view of removed hard drive rack. 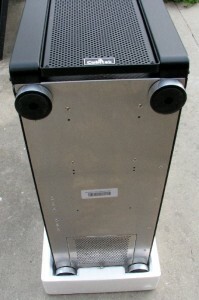 Side view of hard drive rack. 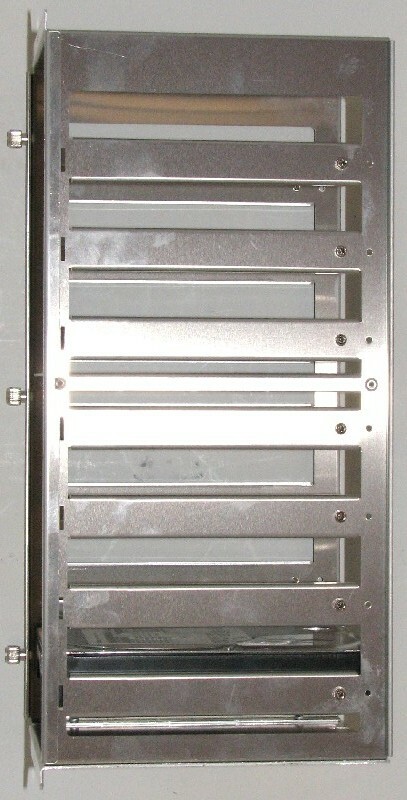 A 2 1/2 inch SSD can be installed below the hard drive cage. The top side of the case is really unique in my experience, in that the top panel is removable. Unscrew the four screws that hold it on, and the whole top panel skin comes off, giving you unhindered access to that area for mounting whatever you want there. I think that Lian Li also has this feature on at least some of their cases, but since I’ve never owned a Lian Li case I’ve never come across this before. And the top panel skin comes right off. 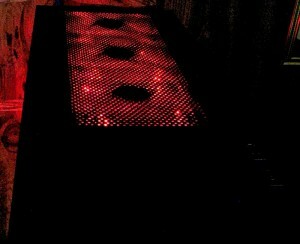 The case comes with a couple of 140 x 25 mm fans that have red LED lights in the top. 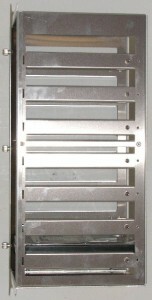 Cubitek used brackets to mount the fans and the mounts run in channels across the top side. 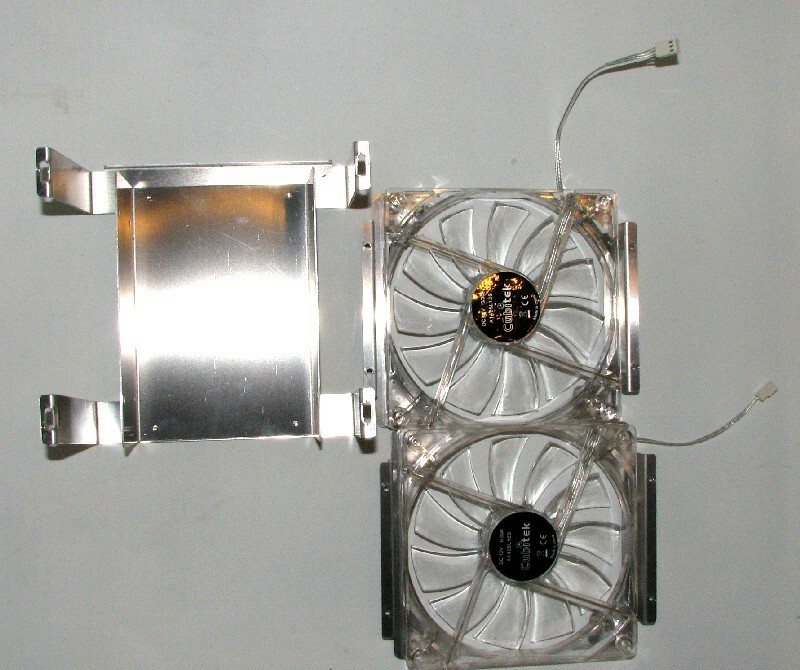 The fan brackets are also set up to mount 120 mm fans too, with 2 sets of mounting holes in them. With this kind of setup, it makes for some very easy mounting solutions for either a 140.2 radiator or a 120.3 radiator. Here is what is under the top panel skin after removal. Fans and aux hard drive cage removed from top. 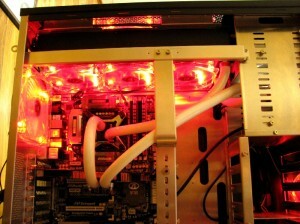 I decided to base this build on an XSPC RX360 radiator, so I had to order myself some 120 x 25 mm red LED Yate Loon fans. I ordered six fans since I wanted to do a push pull radiator setup, along with a couple of Thermochill rad gaskets to seal everything up nice and tight. After flushing the radiator and assembling the fans to it, I saw that I had to trim the fan brackets by a little bit to clear the screws for the adjacent fan, which was easily done with my Dremel tool and a cutoff wheel. 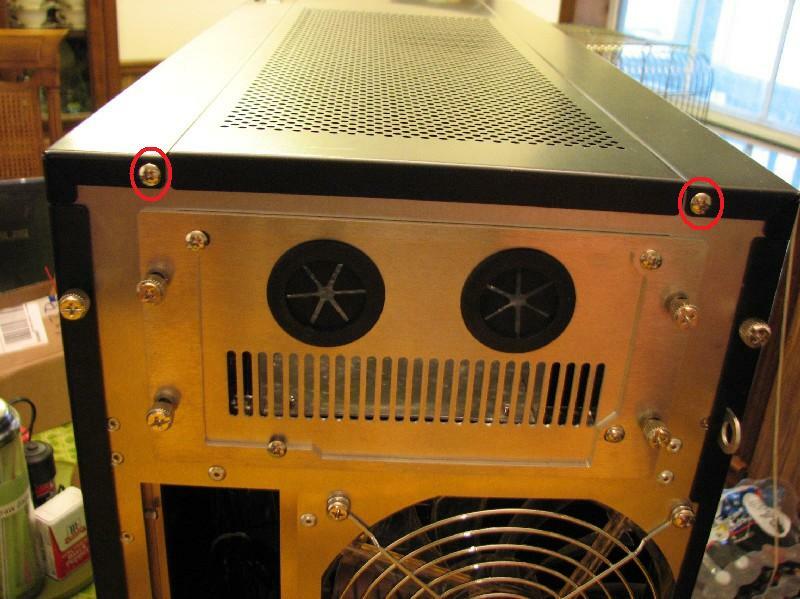 After getting the radiator assembly together with the fans and case brackets, I dropped it into the mounting channel and drilled and tapped some holes on one end, since the pre-drilled and tapped holes wouldn’t align on both ends on my custom setup. But really, any custom mods I had to make were minimal and just concerned the fan brackets and a few screw holes in the channels. 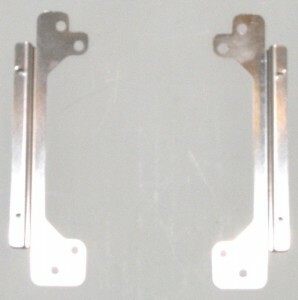 Fan holder brackets before modification. Fan brackets after modding for screw clearance for mounting radiator. 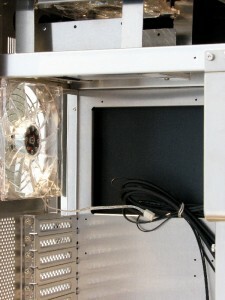 Fan/Radiator assembly mounted in the top of case. I then started mounting my Asrock P67 Extreme6 motherboard in the case and with all the room inside, it was a breeze to do. Once the motherboard was installed, it was time to start running hoses for the cooling loop. 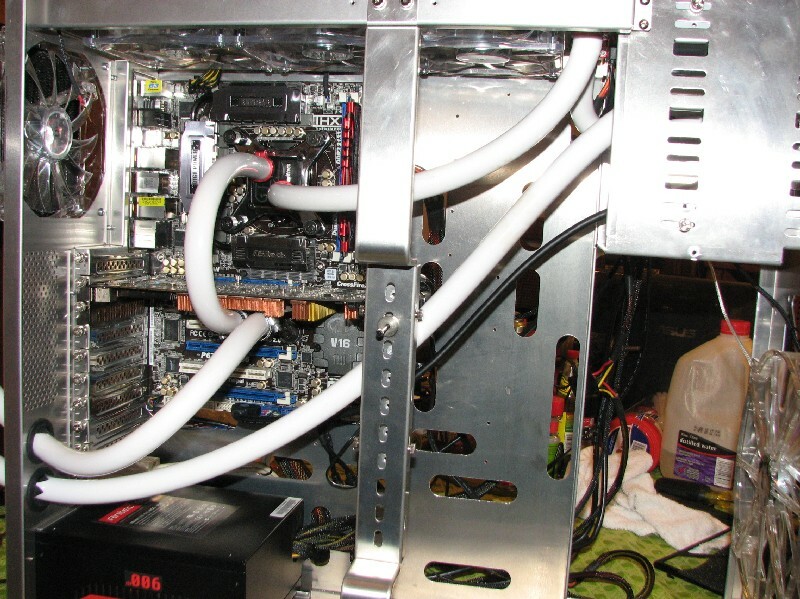 I originally had planned for a CPU-only loop, but around this time I decided that since I had taken an EVGA GTX 260 out of service in my main system which was set up for watercooling, I would upgrade the graphics on this system with that video card. So I added it into the system and started planning the hose routing. 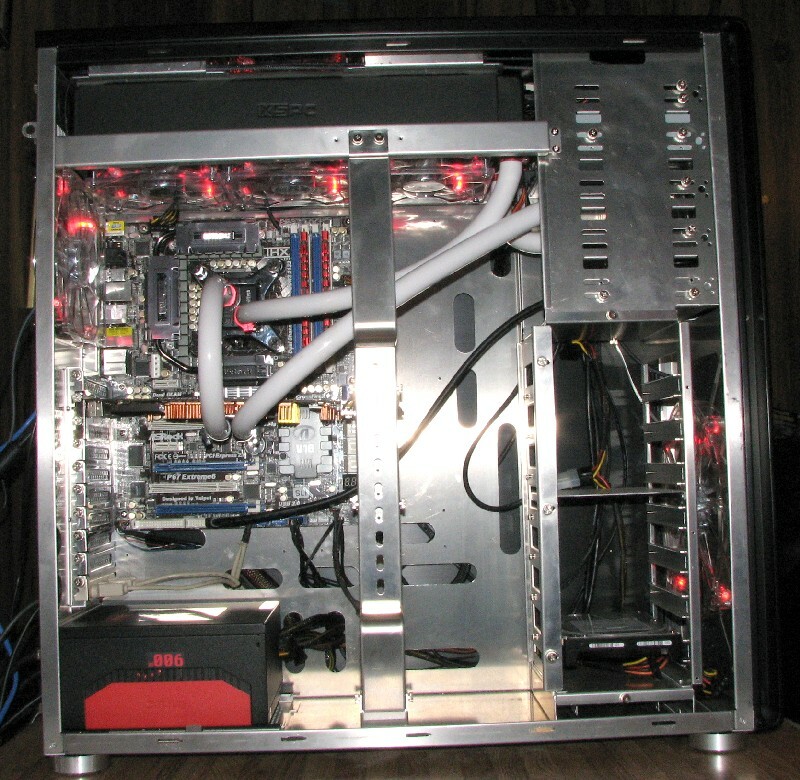 The pump and reservoir I planned to use was a modded MCP350 mounted on an XSPC BayRes 1 and I had procured the Lamptron Touch fan controller from hokiealumnus that he had reviewed for this build. 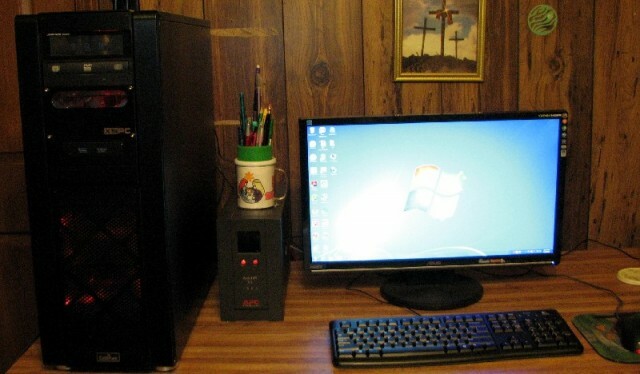 The fan controller was installed in the top slot of the front panel, right above the DVD drive. I then mounted the BayRes 1 next, which takes up two slots and in the bottom front panel mounting slot I went and mounted the USB 3.0 front panel connector that comes with the Asrock board so that I could have front mounted USB 3.0 ports and a total of four front/top mounted USB ports for use. 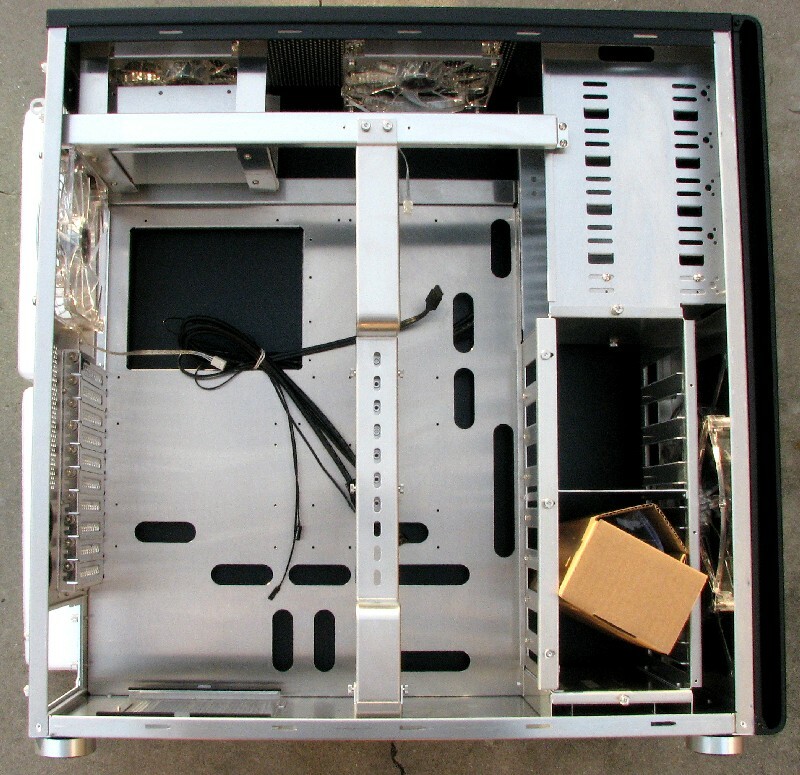 That mounted in the front panel 5.25″ to 3.5″ adapter panel that is included with this case, since the front mount included with the Asrock board is made for a 3.5″ device cutout. No problems were encountered with mounting this in the front panel and Cubitek uses thumbscrews for mounting the front panel devices instead of fancy push button systems. It’s not totally tool-less, but it isn’t hard to run the screws in by hand then use a Phillips screwdriver to snug them down either. For mounting hard drives in the front rack, Cubitek provides some rubber wheels that screw to the sides of your 3.5″ hard drives, which then slide into slots in the front cage. Speaking of the front hard drive cage, it removes easily from the case by taking out two Allen drive screws and sliding the assembly out. 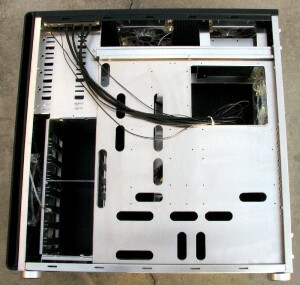 That way you can mount up to seven hard drives in the cage and then install the cage into the case. 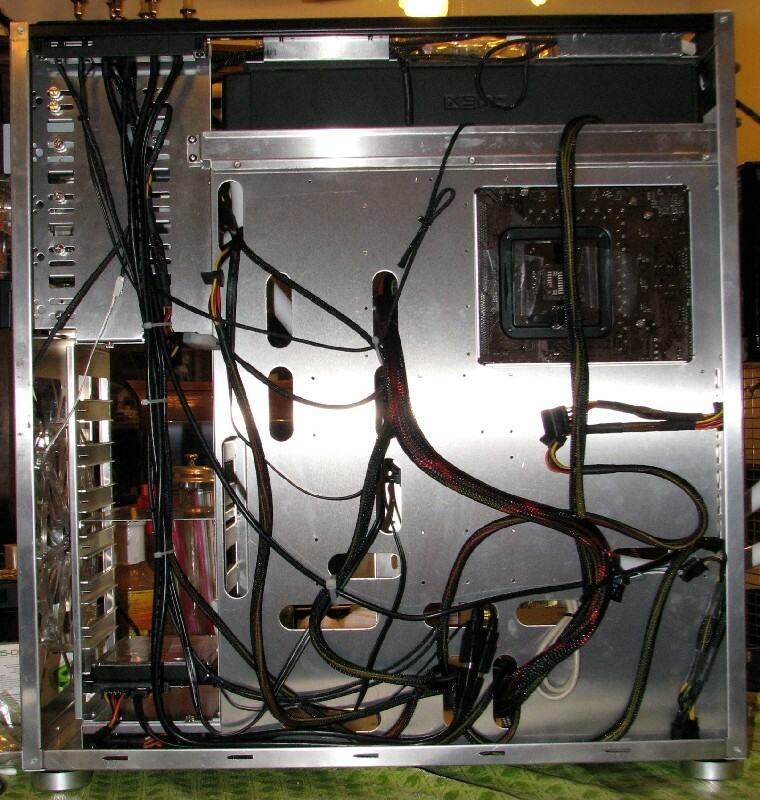 Once all of this was installed, it was time to run the hose for the loop. I used 1/2″ X 3/4″ white Primoflex Pro LRT tubing and used red Lamptron Elite Aluminum 3/4″ clamps on all the barbs except on the video card, which didn’t have enough room to use them. 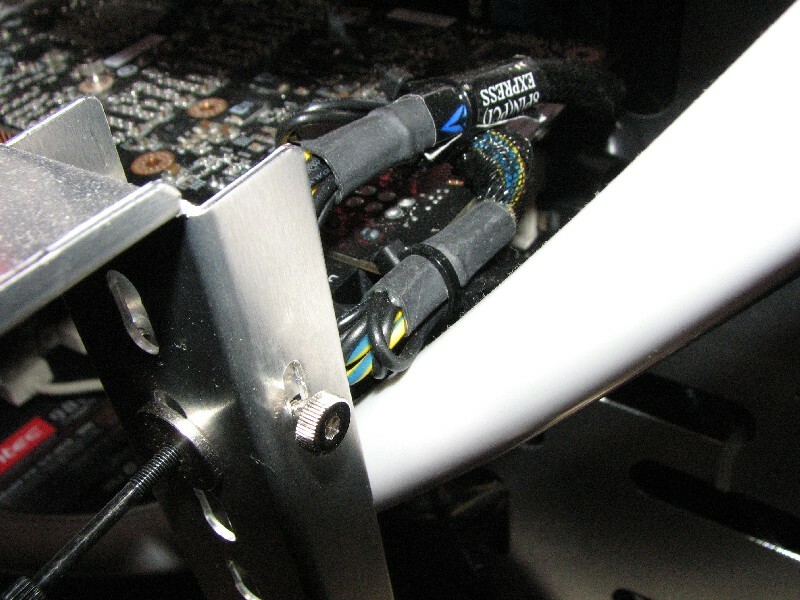 On the video card I used some regular worm drive clamps, which would fit between the hose and ram sink. For my waterblock I just reused an older Swiftech Apogee GTZ block I had and updated the mount to fit LGA1155. Again, no problems were encountered with setting all this up in the case and no modifications were necessary for anything in the case. Once everything was hooked up and the loop leak tested, it was time to neaten things up and give it a go and see how that one radiator was going to work. While hooking up the wiring, I did run into one problem with the Cubitek case. The wire from the power switch must have had a break in it because I couldn’t get it to turn the system on. The switch wasn’t the problem since it would show on my multi meter that it closed when pressing the switch and checking at the legs coming out of the switch, but showed open at the connectors. Luckily for me I had a switch I had salvaged from an old Antec case I had junked out and the switch itself was a drop in fit into the switch assembly that Cubitek chose to use. So after that, the build continued. The wiring that Cubitek uses in this case is both high quality and with plenty of length, so the bad power on wire has to be a fluke. The power on and reset wires are 31.5 inches long and the HDD light wire is 35 inches long. This case doesn’t have a power LED light on it, but since the case uses fans with red LEDs in them it isn’t needed. Wiring done and loop run. Back side ready to be closed up. Top panel ready to be installed on case. Front cover ready to be snapped into place. Once I had everything hooked up, I went ahead and leak tested my loop for a day by powering the pump with an external power supply, so that I wouldn’t have any problems with burning boards out if I had a leak somewhere in the loop. Assembled and ready to power up. 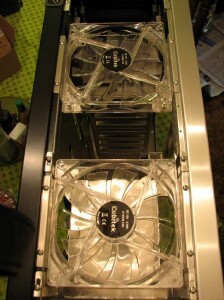 Top with rad fans powered up. After running the system like this for a bit, I decided to see how well the loop would deal with both the processor and video card under load and ran both Prime95 and Furmark at the same time for maximum heat load and while the GPU temps were more than satisfactory, the CPU temps got into the low 70’s, which is little high for my liking for a system that runs 24/7. So I then decided to add another radiator to the loop by utilizing the 140 mm exhaust fan as the mounting spot on it. Since the RX360 radiator on top is such a thick fan and I have it mounted in a push-pull fan setup, I couldn’t mount the 140.1 radiator internally. 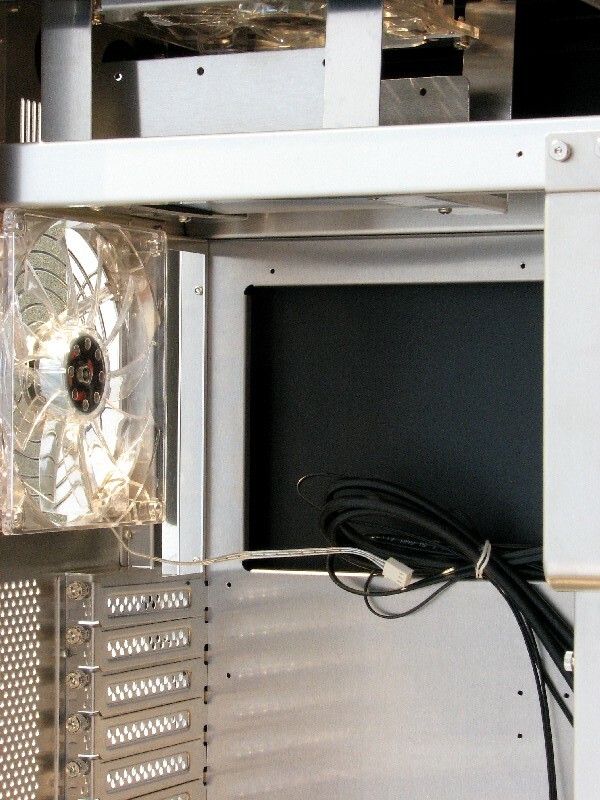 Since Cubitek gives you four bulkhead penetrations to use for plumbing tubing to the outside of the case, it wouldn’t be much of a problem to mount the 140.1 radiator externally on the back side of the case either. For a 140.1 radiator choice, I decided to go with a Hardware Labs GTX 140 for a radiator. Even though it’s a rather finely finned radiator, I figured it would still do well when using the fans that came with the Tank case. I went ahead and installed it on the outside in a push pull configuration with two of the Cubitek fans and then routed the hose through the lower bulkhead grommets and bled down and leak tested the loop once again. In order to have clearance for the outside mounted fans and the side case door, I had to deepen a relief cut into the lip of the overhang on the side door with my Dremel tool and some cutoff wheels. Once that was done, it was simply a matter of installing the side door again and booting the system back up once more. Clearance relief cut in side door overhang. Side view of finished loop installation. 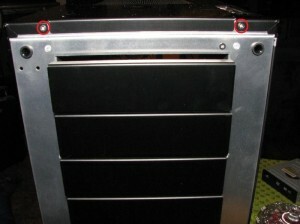 GTX 140 radiator mounted on case back side. Side door installed; computer ready to run again. Front view of finished installation. Front top view, showing the front panel I/O and power & reset buttons. Finally, here is a picture of the finished case next to an APC UPS 1500 and a 24 inch Asus monitor to give you a perspective on the size of this case. First, I would like to apologize to Cubitek for making them wait so long for this review. I got so ambitious for this review that it took me a while to get everything together to do this build and then time to execute it. With that said, I found the Cubitek Tank to be a very well constructed and laid out case, with loads of room inside to work with for the build. 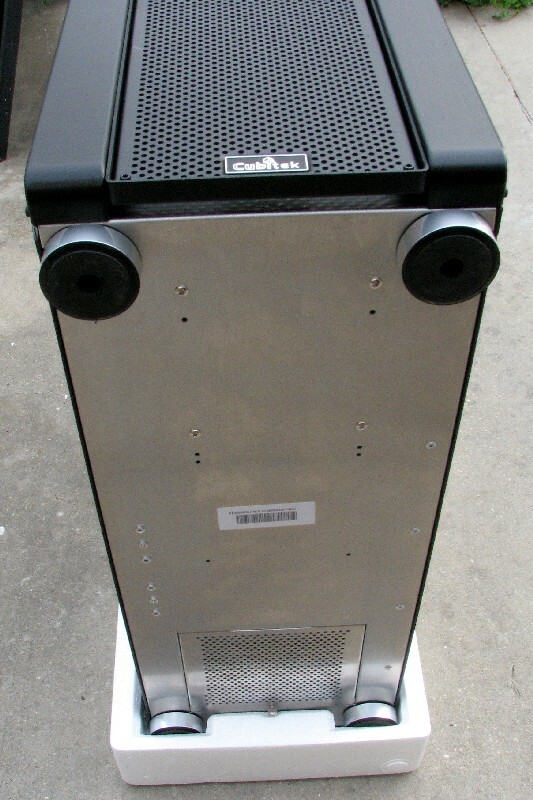 The removable top to the case makes a radiator installation in the top side a breeze and it has room to mount either a 120.3 radiator or a 140.2 radiator in the top section. 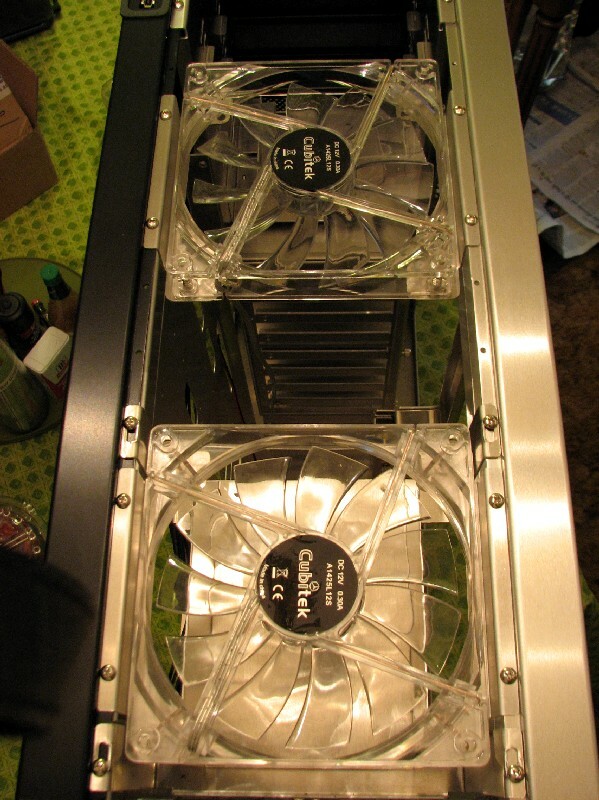 On the back side of the case, Cubitek uses a proper fan grill instead of using stamped holes in the case, minimizing flow noise and restriction. They also give you the choice of either top or bottom mounting for your power supply and give you four rubber grommet bulkhead holes for running tubing or wiring through for an outside mounted radiator. The removable drive cage is also very nice and if you run several hard drives on your system, Cubitek also offers a custom SATA cable harness for hooking up the heard drives neatly. 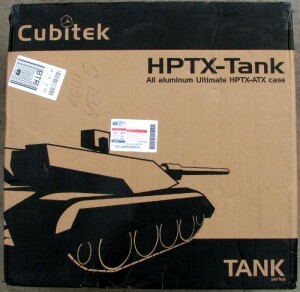 As for the looks, if you like Lian Li cases you will also like the Cubitek HPTX Tank also. There are no flashy adornments on this case; just understated elegance and simple and effective design. One of the very few nits I have to pick with this case is the USB 3.0 front panel connectors being of the pass-through type instead of being headed with a proper USB 3.0 motherboard connector. I imagine that when this case was being designed, motherboards that had onboard USB 3.0 headers were very few and far between. They do give you an adapter to go from the pass through connectors to a USB 2.0 header though, which while it doesn’t give you USB 3.0 connection on the front top panel, it does give you an internal USB connection for the top panel. As for street pricing, I found this case for sale from Sundial Micro for $259.99 plus shipping. Not a cheap case by any means, but then you will be paying that much or more for other high quality aluminum cases in its size class too. After all, there aren’t many cases out there that can mount HPTX sized motherboards such as the EVGA SR-2 like this case can. I originally wanted to do a purely internal install of the loop on this build, but when I decided to add the second radiator to the loop I just couldn’t do it. If I would have gone with a 140.2 radiator on top instead of a 120.3 radiator, I think that I would have had enough room to install the 140.1 radiator at the exhaust fan slot internally, but the 120.3 radiator was just a bit too long and interfered with the 140.1 radiator. Cubitek did make routing the hoses and wiring for the fans very easy though with the bulkhead piercings, and I think the build came out looking very good. The only future addition and change I will make in this setup will be to buy and install a second triple rotary on the outside radiator on the next loop cleaning. As it stands, I would heartily recommend this case for a build if you are looking for a high quality case to build your new system inside of. 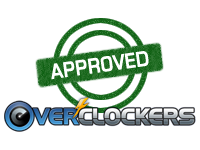 I also find that this case easily earns itself and Overclockers Approved rating too. In closing, I would like to thank Cubitek for sending this very nice case my way for review. 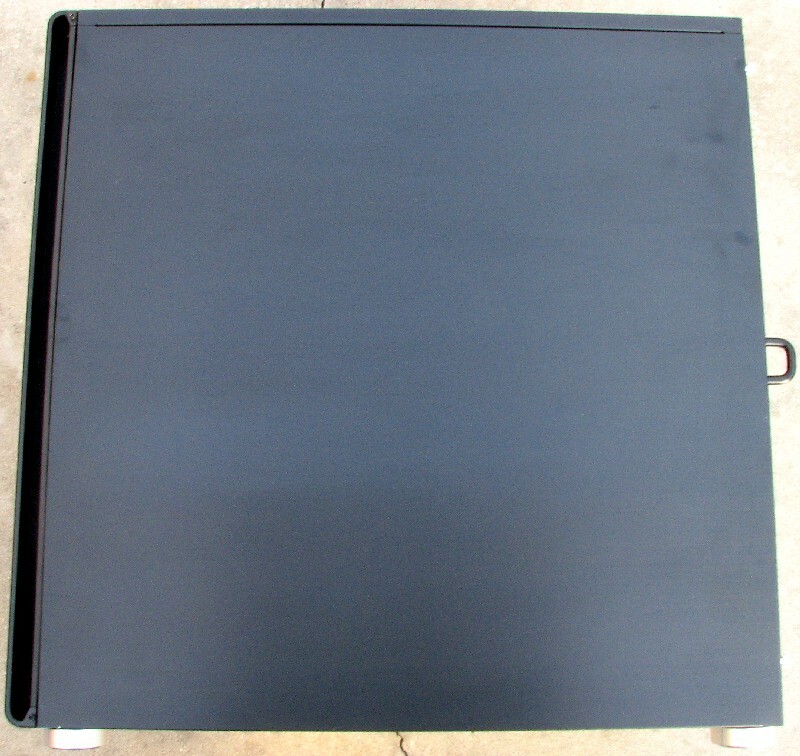 If you are looking for a high quality case to base your next build on, this one should be on your short list. If I read the specs correctly, I get the impression that this is made entirely out of aluminum. Am I correct? I am curious as to how much this thing weighs given it's size.